Solanum viarum is an aggressive perennial shrub native to Brazil and Argentina, that has been introduced to other parts of South America, North America, Africa and Asia. The primary means of dispersal seems to be by livestock (cattle) and wildlife, such as raccoons, deer, feral hogs and birds that feed on its fruits. Intra- and inter- county and state movement of livestock that have recently fed on Solanum viarum may be the primary vector for its spread. However, contaminated hay, seeds and bags of manure for composting also serve as a means for its dispersal. According to Bryson et al. 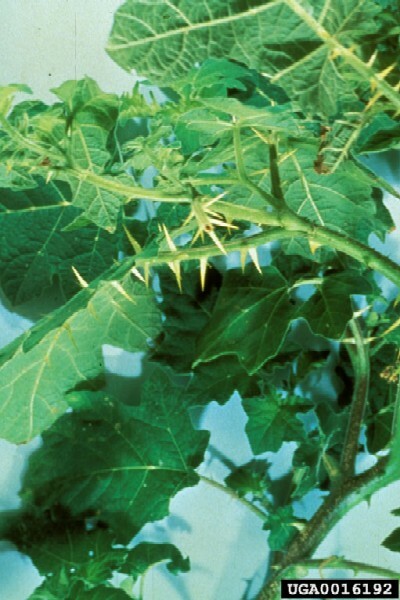 (2002), mature plants of Solanum viarum are 1 - 2m tall and are armed on the leaves, stems, pedicles, petioles and calyxes with broad-based white to yellowish thorn-like prickles up to 1cm long. Leaves and stems are pubescent; flowers are white with five recurved petals and white to cream-coloured stamens. 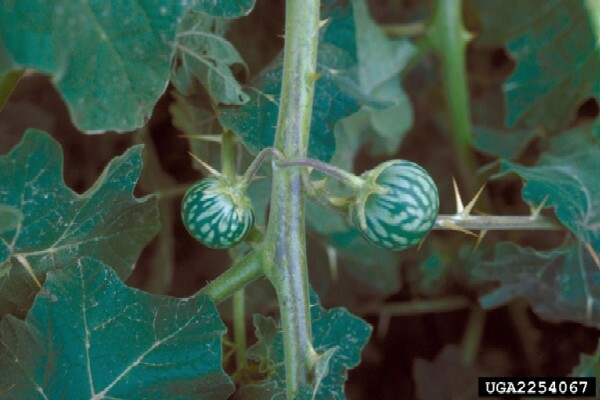 The immature fruits are mottled light and dark green like a watermelon. The mature fruits are smooth, round yellow, and 1 to 3cm in diameter with a leathery skin surrounding a thin-layered, pale green, scented pulp and 180 to 420 flattened, reddish-brown seeds. According to Mullahey (2003), S. viarum has been observed as a common weed in pastures, ditch banks, citrus groves, sugarcane fields, and wet areas of rangeland. S. viarum is typically found in soils belonging to the order of spodosols (nearly level, somewhat poorly drained sandy soil with a spodic horizon 1 -2m below the soil surface). According to Mullahey (2003), seedling emergence has been observed to primarily occur during the dry season. New plants will emerge either from seed or from roots of existing plants. Roots have buds that regenerate new shoots. Contaminated hay, seeds, and bags of manure for composting also serve as a means of its dispersal (Bryson et al., 2002). 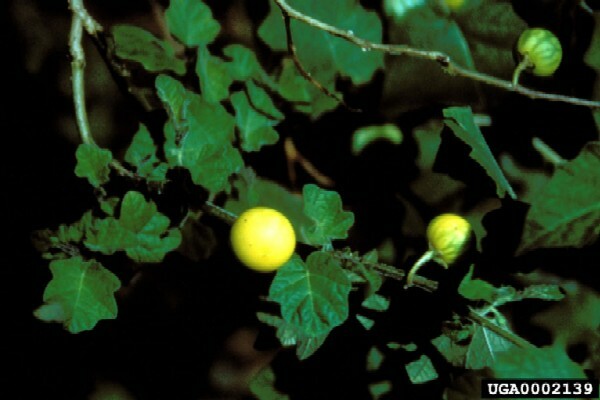 Recommended citation: Global Invasive Species Database (2019) Species profile: Solanum viarum. Downloaded from http://www.iucngisd.org/gisd/species.php?sc=265 on 21-04-2019. Bryson et al. 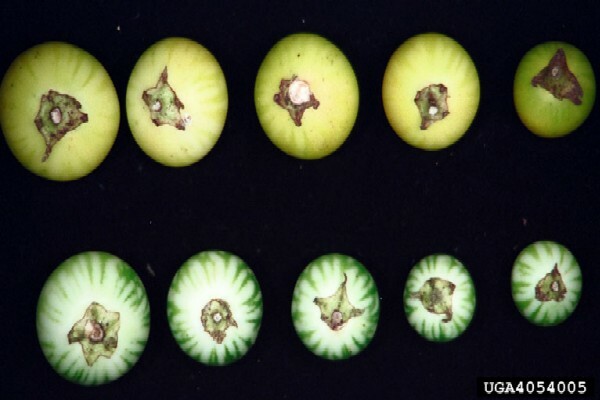 (2002) indicates that S. viarum is a threat to the vegetable crop industry as a competitive weed and because it is an alternate host for numerous pathogens that cause disease in eggplant, peppers, potatoes, tomatoes, etc. These vegetable crop pathogens include the cucumber mosaic virus, gemini virus, potato leafroll virus, potato virus Y, tobacco etch virus, tomato mosaic virus, tomato mottle virus, and the fungal pathogen, Alternaria solani. Mullahey (2003) notes that it is occasionally found growing as a monoculture covering up to 50 acres or more. Bryson et al. (2002) states that damage to croplands, forestlands, and natural habitats and the cost of control of currently infested areas is difficult to determine, but S. viarum has the potential to become a major problem throughout the southern U.S. and could cost farmers and the public billions of dollars annually. Preventative measures: In the United States Animal and Plant Health Inspection Service has initiated an education and notification campaign on the potential weed problem of S. viarum. According to Bryson et al. 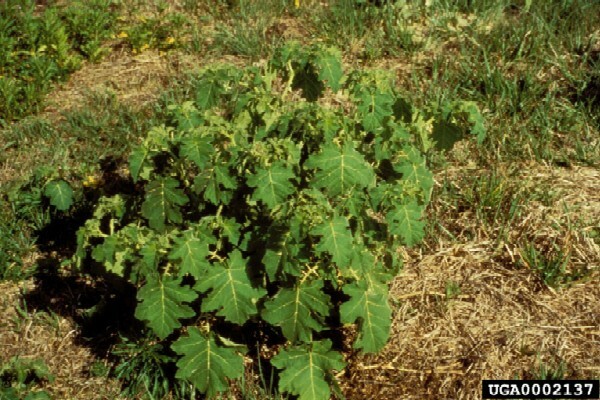 (2002), early detection is paramount to eliminate the threat of this weed, which has the potential to infest millions of acres of pastures, crops, forests, and natural areas in the U.S.
\r\nControl: The best means of control varies according to the population size. Individual plants and small populations of S. viarum should be pulled up and burned completely along with all fruit. Larger populations require repeated mowing and/or one or more applications of an effective herbicide. It is important that the plants are not allowed to fruit. Individuals who find S. viarum should contact their appropriate local agency to verify the identity, document the spread, and begin control measures. Informations on Solanum viarum has been recorded for the following locations. Click on the name for additional informations. Bryson, C., Byrd, J., Westbrooks, R. 2002. Tropical Soda Apple. Mississippi Department of Agriculture and Commerce. Summary: A detailed report on the biology and ecology of S. viarum. Available from: http://www.ceris.purdue.edu/napis/pests/tsa/pausda1.html [Accessed 19 July 2003]. Mullahey, J., 2003. Tropical Soda Apple. Summary: A short summary on the biology and description of S. viarum. Mullahey, J., Ducar, J.,2002. Weeds in the Sunshine: Tropical Soda Apple. University of Florida. Summary: Background information about S. viarum in Florida. Summary: An information network that provides geographic distribution information on S. viarum. USDA-NRCS (United States Department of Agriculture). 2002. 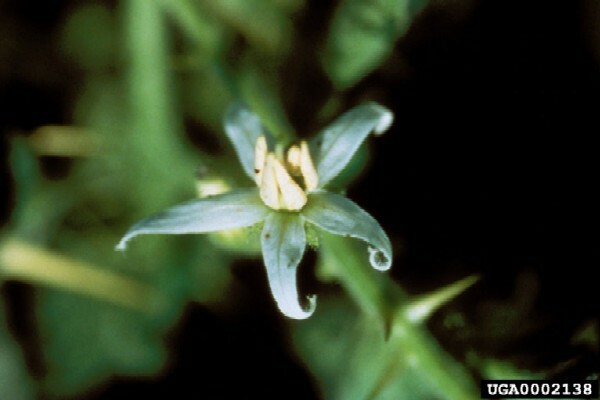 Solanum viarum. Plants Database. Natural Resources Conservation Service. Available from: http://plants.usda.gov/cgi_bin/plant_profile.cgi?symbol=SOVI2 [Accessed 21 August 2003].